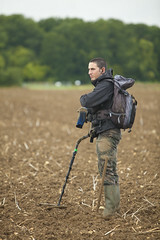 Back in February we ran a competition for the best metal detecting video. We offered up prizes of £400 (1st), £200 (2nd) and £100 (3rd) to entrants. We had lots of entrants, and whittled the original contenders down to five, of which you can now vote for your favourite video to decide who wins the prizes. We’ve inserted the videos below for ease, and you can then vote via our Facebook competition app. Voting closes Monday 8th April.